Sometimes it's fun to look back and pick out some of our favorite showpieces! This beautiful tree of flowers was stunning in person, there was nothing like it. With rich autumn colors and tropical greenery the line and balance of it all was amazing. This bright spring piece was on the entry table in one of our clients homes. It was given as a birthday present. We loved the peaches and pinks, the mix of textures and of course the stunning vase. This beautiful centerpiece for Mothers Day was a showstopper, with Calla lilies swirling on the outside of the ease and a giant arrangements of lilies, roses, hydrangea and cherry blossom branches, it was truly amazing. Going green is all the rage and this piece exemplified that theme. with fun tropical green anthirium, hanging amaranths, white oriental lilies, bells of Ireland and giant tropical leaves, this arrangement sparkled (literally with little led light strands woven trough the arrangement). Another one of our favorites, I like to call it the canopy. 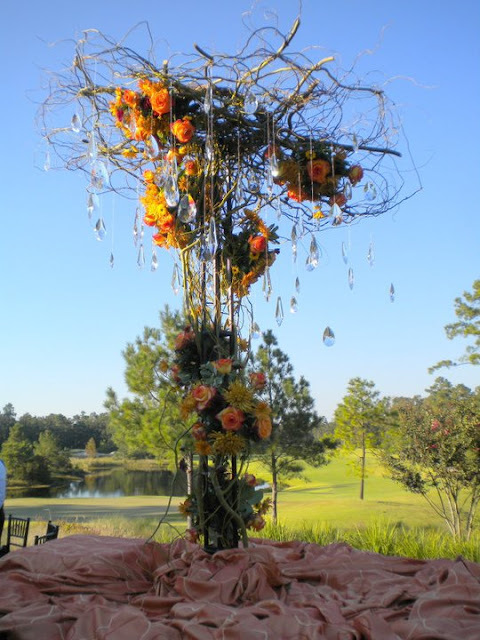 It was amazing in person, as it stood on a 4 foot table with over 30 giant crystals hanging from the canopy of flowers and curly willow. Each crystal caught the sunlight and shined as the breeze moved through the patio. It's fun to look back and see some of the fun pieces we've done over the years, and more importantly to let you see them too. For as we like to say, if you can dream it (or if you have an idea) we can make it.